The life of a veterinarian is a mixed bag. One minute, in a meticulously clean operatingtheatre, performing routine surgery on an anaesthetised cat; the next, battling through wind and rain to help a (large and frightened) bullock that's managed to wrap itself in wire. From 'A' levels to veterinary practice; it takes hard work to get there and even more to stay! Biology 'A' Level, as well as one or two from Physics, Chemistry and Maths. Grades at 'A' Level, two A's and a B, or, in some cases, three A's. Alternatively, a distinction in BTEC Diploma in Animal Science may be considered. The requirements for mature students without degrees include good GCSE and 'A' level results in the above subjects. Graduates should have at least one upper second class degree ina related subject. For both, check first, as these students may have to pay full tuition fees. Applications for places on veterinary degree courses are made through the Universities &College Admissions Service, UCAS. Anyone interested in applying should consult the prospectus carefully first. Evidence of a candidate's interest and commitment to the subject will be required by alluniversity veterinarian schools. It will be expected that they have worked with and handledanimals, including livestock. This is another thing to check-work experience requirements dovary between universities. All vets are obliged to deal with emergencies that involve any species of animal, at any time, every day of the year. The vets' job involves a huge amount of commitment and hard work wherever it takes them. Their role is crucial in the prevention of disease in animals, the care of pets, horses, farm animals and zoo animals and in the provision of medical and surgical treatment for them all. This is where most vets start their working lives. Small animals like cats, dogs, rabbits and other companion animals are seen more than any other animal, but, unless otherwise stated, vets from general practices will also treat horses and other large animals. The experience gained by working at a general practice is extremely valuable; whatever the next stage in a vet's career. Basically, the work entails routine surgery like the castration of dogs and neutering of cats, giving preventive treatment by vaccination, the supply of prescribed drugs for worming and flea treatment, supervision of special diets and dealing with emergencies. This is a very basic outline though-there are numerous other elements to be considered! For vets who want to continue working in small animal practice, there are several different areas of specialisation to choose from if they wish to study further. Soft tissue, orthopaedics, Castro, ear, nose and throat, dermatology-to name but a few. General practices will refer patients to these specialists' clinics, or practices, in specific cases. Other options for specialising include equine veterinary practice, mixed practice, zoo animals, food-producing animals, wildlife, research and genetics, plus various further specialisations within these headings and others not mentioned here. 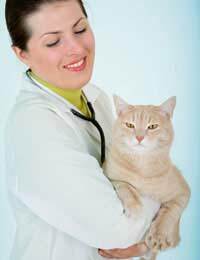 Whatever direction vets choose to pursue in their careers with animals they are expected to keep their skills up to date and their knowledge current, to keep abreast of changes in all aspects of veterinary care and procedures. Becoming a vet requires dedication to studies, patience and a total commitment to animals. The hours are long-animals get sick 24 hours a day, 365 days a year. Vets alsoneed to be good communicators (animals have owners) must work well within a team (with other vets and veterinary nurses) and be able to organise their paperwork! The rewards are good remuneration and the satisfaction of spending a lifetime helping animals-with all thefantastic experiences that involves. Hi I’m in year 8 picking my options for GCSE next year. I’ve always want s to be a vet it’s a dream so I know for sure I’m taking triple science but to become a vet what else do I need to take ? Entry requirements are quite high. Generally, the vet schools require As and Bs at GCSE and A 'level, especially in science subjects, as stated in the article. English and maths grades are also important. Hi I’m in year 8 picking my options for GCSE next year . I’ve always want s to be a vet it’s a dream so I know for sure I’m taking triple science but to become a vet what else do I need to take ? Hi , I am in year 8 and am currently trying to decide on my options for GCSE level . I would like to work as a surgical vet when I’m older and already have some options in mind but I’m not sure if they would help me to achieve this . They are : animal care , triple science , media and photography . I’m not sure if I should take a language or not . Also would work experience at my local vet help me at all ?? Hi, I’m 17 years old and turning 18 this year, I have come to be very interested in helping animals who are in bad condition or been neglected I’m not sure what career this comes under but I’m doing a different course to what I believe I should be doing if I wanted to care for animals I have English and currently doing my maths in order to work with aninmals what’s the basics you need or what’s the main GCSE you need in order to work with animals? You can see all you need to know via the gov.uk link here . I hope this helps. I am in yr 8 and I really want to be a vet when I'm older what would help me to be a vet? Hi, I’m in year nine and I’ve now started my GCSE courses and I’m taking triple science. I’ve taken an interest in becoming a vet as I love animals and have two cats of my own. I was wondering if you know of any work experience I would be able to do. Or anything that would help me achieve my dream. Hi, I'm Doug, I'm 12 years old in Year 8, and I want to do some working experience at a veterinary surgery over the holidays. Can you provide an answer? Due to your age, it is unlikely you would be allowed to conduct work experience. The youngest age a child can work part-time is 13, except children involved in areas such as television, theatre and modelling. If you wish to conduct some voluntary work, then the likes of National Trust allows families to volunteer. This may give you a chance to work up close with animals as a start. You have time yet to get your GSCE's. Alternatively, you could study to become a veterinary nurse, from which you need five GCSEs at grade C and above, which must include English language, maths and a science subject, please see link here . Generally, the vet schools require As and Bs at GCSE and A level, especially in science subjects. Usually, the veterinary degree course is five years long. To become a veterinary nurse, you will need five GCSEs at grade C or higher. These must include English Language and two science subjects, one of which may be Maths. Please see link here and here. Please see RCVS link here for further advice. I hope this helps. I am 15 and I really love animals.I plan to become a vet and am taking a lot of biology, math, English, and animal science classes.I live in the United States and was wondering how to become a vet in the U.K. I'm in year 9, and I am starting to choose my GCSE options. What grades do you have to get to become a veterinary surgeon, and what universities can I go to? You can see more via the link here. However, studying to be a vet is extremely competitive and popular, therefore the higher the grades you get in GSCEs and A'Levels, the better the chance you will have to get a place. Hi I am in year 9 and about to choose my GCSEs and I really would like to become a large animal vet we I finish school but I don't know what subjects to choose??? I want to be a veterinary surgeon, but I'm doing history, life sciences and mathematics my question is would I still be able tobecome a vet doing those subjects?